The new year is here, which means the latest design trends are too! 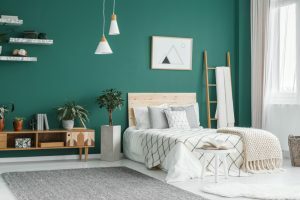 With last year’s emphasis on high contrast, comfort, farmhouse elements, and shades of purple, what can we expect from 2019 interior design trends? Read on to find out. Bio-what? “‘Biophilia’ describes the human tendency to connect with nature (NCBI). On average, humans spend 90% of their time inside a building. When humans are separated from a natural environment, our physical and mental well-being is negatively impacted causing side-effects such as disrupted circadian rhythms, stress, and unhappiness. A biophilic design is a sustainable design solution that seeks to reconnect our living spaces to other forms of life by bringing those natural elements we need, indoors (Sage Glass)” (ViaDesign). 2. PPG Paints Interior Design Color of the Year: Night Watch. Inspired by nature, this deep hunter-green is suitable for accents, interiors, and exteriors. PPG senior color marketing manager, Dee Schlotter said, “Night Watch is about bringing the healing power from the outdoors into your home through color. The dark green hue pulls our memories of natural environments to the surface to recreate the calming, invigorating euphoria we feel when in nature.” Not surprisingly, Night Watch pairs very well with Pantone’s color of the year Living Coral. Another connection to nature are the natural wood and natural textures we will see trending in 2019. Think light woods (dark cherry is out) and jute rugs, storage baskets, and woven wall hangings. Gone are the pastel, muted, watercolor florals, instead we will see bright, bold florals with contrasting colors. While you may not be ready to go all-out, think of how you can incorporate florals with throw pillows, bedspreads, and other accents. The same idea goes for geometric patterns – they’re not new, but we will see them as a bit more dramatic with oversized patterns. What are your thoughts about these design trends? Which are you most eager to bring into your home? We’d love to hear your thoughts.